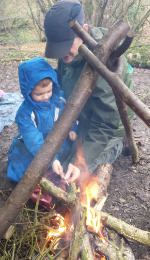 EVERY MONDAY* - Appleton Forest School 10am at Lumb Brook Valley. Sessions are at least an hour but often stretch on to midday if we get into things (which we usually do). This is an ongoing series of child led sessions. Recently we've done some tool use with under 5s, explored, identified trees, stream walked, made hazel hurdles, bean poles and more. Its very organic and often involves participants influencing what happens at future sessions. PRICE £5 a child with sibling discounts, etc. NB – 1st and 15th June session are not running as we’re away on training courses, etc. SATURDAY 6th June – BEAR HUNT at New Moss Wood – Join us at our Woodland Trust Wood on the Manchester Mosses. After porridge we’ll be searching for the 3 bears, Paddlington, Sir Bearmund Hillary and other colourful characters before building them dens. Once settled we’ll start a fire and have a campfire Teddy Bears Picnic. PRICE £10 a child with sibling discounts, etc. PRICE £5 each. Only 6 places for each walk! SATURDAY 20th June - 10am Midsummer Forest School- at Gorse Covert Mounds - Join us for the penultimate longest day. Exploring, Dens, fire cooking, story telling and more. PRICE 10 a child with sibling discounts, etc. SATURDAY 26th/SUNDAY 27th June. Birthday parties. We’re hosting Birthday parties at Appleton and Gorse Covert Mounds. Get in touch for your big day. We make it extra special! UPDATE - Now moved to Friday! We've been running forest school sessions for our 'regulars' since February 2015 and its been a lot of fun! Looking back of our sessions my first thought is one of pride. I've seen Forest School build our pupils' confidence grow in leaps and bounds. Ranging from 2 to 14 year olds at first there was trepidation with going off path and into the Brook but soon this became normal so every session begins with a dip in the stream to have a look. This is led by the children - there's always this desire to explore and investigate. Another regular is fire building. Fear of fire has grown into respect. Pupils can now safely identify and collect appropriate firewood - deadwood, tinder, kindling and logs, build a fire and light it with a flint and steel. We've made char cloth and cooked on the fire. We've developed and agreed safety rules which we all follow. This is something we can only do with the express permission of the land owner - so thank you Woodland Trust - and is carried out in a 'leave no trace' way. Most sessions we use tools to make something. We've learnt to identify plants and in particular hazel. A hazel hurdle/habitat pile made by 2 - 14 year olds and parents. Lumb Brook Valley has an abundance of hazel and with the permission of the Woodland Trust we've been coppicing hazel (cutting it back). Coppicing makes hazel live for longer and develops an understory - leave hazel too long and it turns into quite a large tree. This reduces the burden of maintenance by the trust so hopefully we're saving them money to spend on other things. By cutting it back every 12 years or so you prevent it turning into a tree and help the herb layer get more light. At Lumb Brook that means more bluebells! Our greatest achievement is that we've got children using tools safely, recognising dangers (such as a sharp blade) and taking appropriate precautions. The only injury we've had is Rawdon's pride when he fell over in the mud on a bear hunt. Sessions are child led so we'll see where we go but due to our passion, commitment to and love of nature we've now got another land owner on board to use even more woods in Lumb Brook Valley. We'll update you when all the paperwork is in place but this will give our pupils the chance to develop their own site for forest school - so more exploring, more tool use, more learning and more fun. Why not contact us to book onto a session? Have a look at our Appleton Forest School Facebook Page where we post site specific updates or alternatively our Fairy Forest School page for upcoming events. Its a chilly start to May but soon it'll be lovely and warm (hopefully). EVERY MONDAY - Including Bank Hols. Appleton Forest School 10am at Lumb Brook Valley. Sessions are at least an hour but often stretch on to midday if we get into things (which we usually do). This is an ongoing series of child led sessions. Recently we've done some tool use with under 5s, explored, identified trees, stream walked, made hazel hurdles, bean poles and more. Its very organic and often involves participants influencing what happens at future sessions. PRICE £5 per child with sibling discounts, etc. Sunday 10th May - PRIVATE GRUFFALO BOOKING at Gorse Covert Mounds. Get in touch if you'd like your own personalised session for family or friends. FAIRY TALE WOOD Saturday 16th May 10am-12 noon New Moss Wood, Glazebrook. The 3 bears will be serving porridge to set us up for our adventure . Join us as we wander the woods in search of fairy tales and try making a house of sticks before the big bad wolf blows them down. Followed by hot dogs (sorry 3 little pigs) cooked on a campfire. PRICE £10 per child with sibling discounts, etc. FAIRY TALE WOOD Sunday 17th May 10am-12 noon Lumb Brook Valley, Appleton. FREE MINIBEAST HUNT Saturday 23rd May - Exclusively for our Fairy Forest School Facebook friends. All you have to do is like, follow and share our facebook page. More details on facebook. Don't forget our Appleton Forest School for the BANK HOLIDAY. HALF TERM - TUESDAY 26th May - NEOLITHIC VILLAGE at Gorse Covert Mounds. Our favourite session so far exploring nature and building dens. Campfire Lunch Included. PRICE £10 per child with sibling discounts, etc. See our previous blog here. HALF TERM - WEDNESDAY 27th May- BEAR HUNT at New Moss Wood, Glazebury. 9:45am Porridge, 10am set off and teddy bears picnic for lunch with campfire cooking. PRICE £10 per child with sibling discounts, etc. See our previous blog here. HALF TERM -THURSDAY 28th May - WET n WILD. A nature walk along the length of the Dingle for adults and/or children. You will get wet. 10am (lasts up to 2 hours) PRICE £5 each. HALF TERM - FRIDAY 29th May - FOREST SCHOOL FRIDAY. A bit of everything! Using tools, dens, camp fires, nature. Great for those thinking of taking up forest school. Great for home educators or teachers, nurseries, etc. thinking of introducing forest school or families just wanting to get outside and do stuff! What is forest school? Find out here. FAIRY TALE WOOD Saturday 30th May -noon Gorse Covert Mounds. The 3 bears will be serving porridge to set us up for our adventure . Join us as we wander the woods in search of fairy tales and try making a house of sticks before the big bad wolf blows them down. Followed by hot dogs (sorry 3 little pigs) cooked on a campfire. PRICE £10 per child with sibling discounts, etc.